My introduction to soba noodles was actually on a plane flying from Tokyo to Honolulu, admittedly not the best place to get good food. The flight attendants came around with breakfast and asked if I wanted the Japanese or the American breakfast, and I chose the Japanese because I could see the noodles that someone else already had on their tray. I swirled them in the sauce and enjoyed the slippery sensation and flavor while the American woman next to me eyed them with a look that said, “I can’t believe you are eating that.” I just smiled and enjoyed my breakfast. Soba noodles also make a perfect light lunch on a hot day and I’ve got my 6-year-old, Builder Guy, hooked on them. Sometimes we have them plain with the traditional dipping sauce, but other times I like them as a salad tossed with some vegetables. This particular recipe has lime juice, soy sauce, sesame oil, honey, grated ginger, scallions, and cilantro for flavor, and zucchini, carrots, and avocado for vegetables. I could eat this all the time, but it tastes best when zucchini is in season, so now is a perfect time of year for this salad. I follow Maki’s method for cooking soba noodles, and it works perfectly. One common question about soba noodles is whether they are gluten-free because buckwheat is not actually wheat at all and is naturally gluten-free, and the answer is it depends. Many soba noodles have wheat flour added to act as a binder, but you might find some gluten-free soba such as Eden Selected Buckwheat Soba or King Soba Noodles in larger grocery stores, Whole Foods, or even an international grocery store. Of course, you can also make your own gluten-free soba. And if you cook gluten-free, make sure you also choose a gluten-free soy sauce. I made this with our homegrown scallions, which have started to peak in production. Our ginger isn’t quite ready, but hopefully next month we’ll have fresh homegrown ginger root. Squash vine borers defeated our efforts to grow zucchini this summer, but there’s always next year. Just a quick reminder that the deadline for the second anniversary of Grow Your Own is coming up on August 30. If you haven’t yet sent your post information, you still have time. Email me at andreasrecipesgyo AT gmail DOT com. If you are new to the event, you can read more about the rules for participating at the Grow Your Own page. I’m excited about the anniversary event and can’t wait to see all your posts! Makes 4 to 6 large servings. 1. Bring water to boil in the pot. Add the soba and reduce the heat so the water is simmering, not at a hard boil. Cook until soft and pliable, but not mushy. Drain and add very cold water back to the pot, add some ice if necessary. Stir the noodles with your hands or long chopsticks to loosen any remaining starches. Drain again and run cold water over the noodles until the water runs clear. 2. Whisk together lime juice, soy sauce, ginger, honey, and sesame oil in a large bowl. Add the zucchini, carrots, scallions, and avocado chunks and toss to combine. Season with salt and pepper. 3. Serve immediately at room temperature with cilantro for garnish. A delighful summer salad! A great combo! Looks so light! I haven’t tried Soba Noodles and keep forgetting to buy them! I love soba noodles. Love the veggies you added. Bookmarking this one for sure! This is the perfect sort of summery salad… I don’t know if I want it for breakfast LOL, but lunch or dinner sounds great! 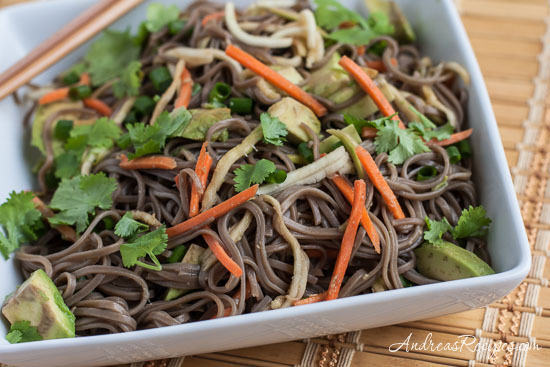 Soba noodles are my favorite noodles, they are nutritious and flavorful on their own! I really love the dressing you used, and the addition of avocaodo. How did I not think of that before! !